Italian physician and statesman; born at Padua in the middle of the seventeenth century; died in Constantinople in the second decade of the eighteenth century. 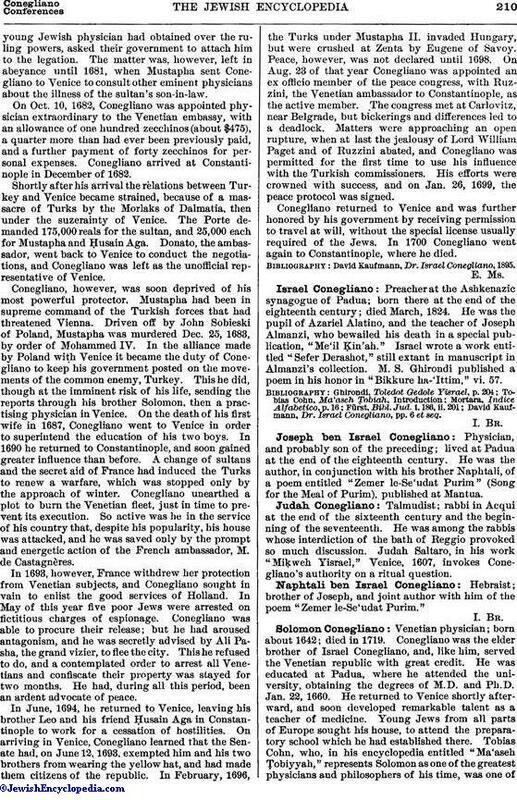 After obtaining his diploma Israel Conegliano practised medicine in Venice for two years, and then went to Constantinople. Despite the state of anarchy which reigned at Constantinople at that time, he won the favor and respect of the sultan, and also of his grand vizier Kara Mustapha. Giovanni Morosini, the ambassador of Venice, and his successor, Giambattista Donato, realizing the influence theyoung Jewish physician had obtained over the ruling powers, asked their government to attach him to the legation. The matter was, however, left in abeyance until 1681, when Mustapha sent Conegliano to Venice to consult other eminent physicians about the illness of the sultan's son-in-law. On Oct. 10, 1682, Conegliano was appointed physician extraordinary to the Venetian embassy, with an allowance of one hundred zecchinos (about $475), a quarter more than had ever been previously paid, and a further payment of forty zecchinos for personal expenses. Conegliano arrived at Constantinople in December of 1682. Shortly after his arrival the relations between Turkey and Venice became strained, because of a massacre of Turks by the Morlaks of Dalmatia, then under the suzerainty of Venice. The Porte demanded 175,000 reals for the sultan, and 25,000 each for Mustapha and Ḥusain Aga. Donato, the ambassador, went back to Venice to conduct the negotiations, and Conegliano was left as the unofficial representative of Venice. Conegliano, however, was soon deprived of his most powerful protector. Mustapha had been in supreme command of the Turkish forces that had threatened Vienna. Driven off by John Sobieski of Poland, Mustapha was murdered Dec. 25, 1683, by order of Mohammed IV. In the alliance made by Poland with Venice it became the duty of Conegliano to keep his government posted on the movements of the common enemy, Turkey. This he did, though at the imminent risk of his life, sending the reports through his brother Solomon, then a practising physician in Venice. On the death of his first wife in 1687, Conegliano went to Venice in order to superintend the education of his two boys. In 1690 he returned to Constantinople, and soon gained greater influence than before. A change of sultans and the secret aid of France had induced the Turks to renew a warfare, which was stopped only by the approach of winter. Conegliano unearthed a plot to burn the Venetian fleet, just in time to prevent its execution. So active was he in the service of his country that, despite his popularity, his house was attacked, and he was saved only by the prompt and energetic action of the French ambassador, M. de Castagnères. In 1693, however, France withdrew her protection from Venetian subjects, and Conegliano sought in vain to enlist the good services of Holland. In May of this year five poor Jews were arrested on fictitious charges of espionage. Conegliano was able to procure their release; but he had aroused antagonism, and he was secretly advised by Ali Pasha, the grand vizier, to flee the city. This he refused to do, and a contemplated order to arrest all Venetians and confiscate their property was stayed for two months. He had, during all this period, been an ardent advocate of peace. In June, 1694, he returned to Venice, leaving his brother Leo and his friend Ḥusain Aga in Constantinople to work for a cessation of hostilities. On arriving in Venice, Conegliano learned that the Senate had, on June 12, 1693, exempted him and his two brothers from wearing the yellow hat, and had made them citizens of the republic. In February, 1696, the Turks under Mustapha II. invaded Hungary, but were crushed at Zenta by Eugene of Savoy. Peace, however, was not declared until 1698. On Aug. 23 of that year Conegliano was appointed an ex officio member of the peace congress, with Ruzzini, the Venetian ambassador to Constantinople, as the active member. The congress met at Carlovitz, near Belgrade, but bickerings and differences led to a deadlock. Matters were approaching an open rupture, when at last the jealousy of Lord William Paget and of Ruzzini abated, and Conegliano was permitted for the first time to use his influence with the Turkish commissioners. His efforts were crowned with success, and on Jan. 26, 1699, the peace protocol was signed. Conegliano returned to Venice and was further honored by his government by receiving permission to travel at will, without the special license usually required of the Jews. In 1700 Conegliano went again to Constantinople, where he died. David Kaufmann, Dr. Israel Conegliano, 1895. Preacher at the Ashkenazic synagogue of Padua; born there at the end of the eighteenth century; died March, 1824. He was the pupil of Azariel Alatino, and the teacher of Joseph Almanzi, who bewailed his death in a special publication, "Me'il Ḳin'ah." Israel wrote a work entitled "Sefer Derashot," still extant in manuscript in Almanzi's collection. M. S. Ghirondi published a poem in his honor in "Bikkure ha-'Ittim," vi. 57. David Kaufmann, Dr. Israel Conegliano, pp. 6 et seq. Physician, and probably son of the preceding; lived at Padua at the end of the eighteenth century. He was the author, in conjunction with his brother Naphtali, of a poem entitled "Zemer le-Se'udat Purim" (Song for the Meal of Purim), published at Mantua. 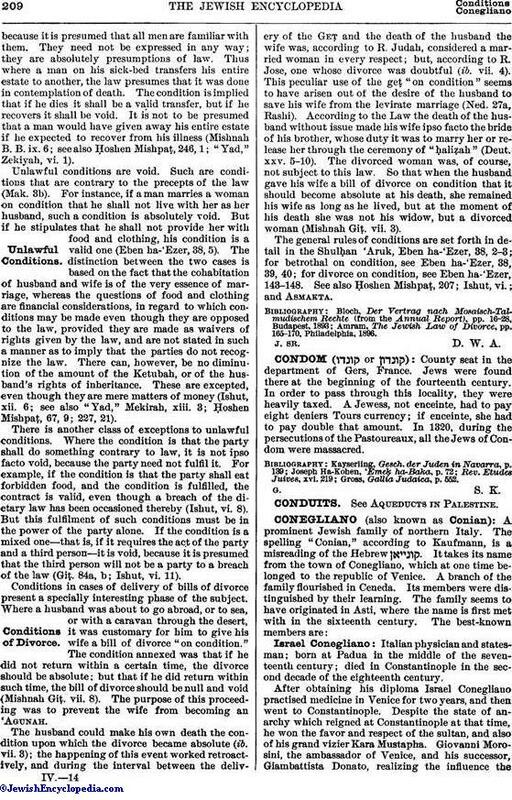 Talmudist; rabbi in Acqui at the end of the sixteenth century and the beginning of the seventeenth. He was among the rabbis whose interdiction of the bath of Reggio provoked so much discussion. Judah Saltaro, in his work "Miḳweh Yisrael," Venice, 1607, invokes Conegliano's authority on a ritual question. Hebraist; brother of Joseph, and joint author with him of the poem "Zemer le-Se'udat Purim." Venetian physician; born about 1642; died in 1719. Conegliano was the elder brother of Israel Conegliano, and, like him, served the Venetian republic with great credit. He was educated at Padua, where he attended the university, obtaining the degrees of M.D. and Ph.D. Jan. 22, 1660. He returned to Venice shortly afterward, and soon developed remarkable talent as a teacher of medicine. Young Jews from all parts of Europe sought his house, to attend the preparatory school which he had established there. 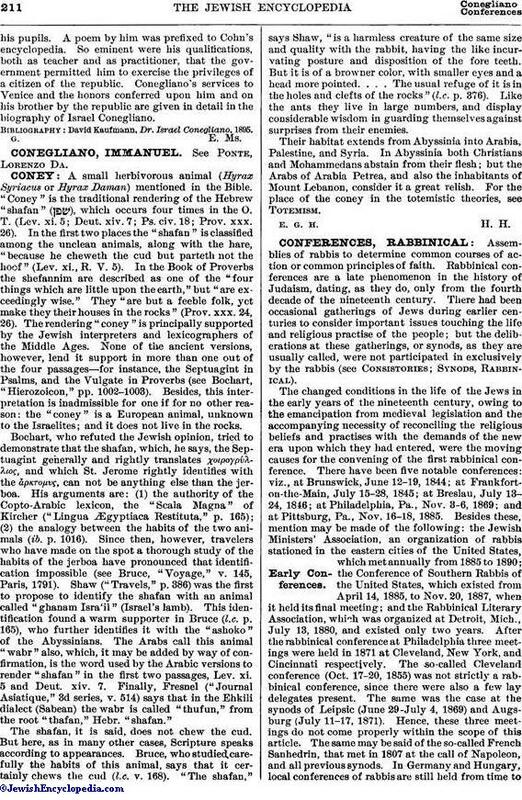 Tobias Cohn, who, in his encyclopedia entitled "Ma'aseh Ṭobiyyah," represents Solomon as one of the greatest physicians and philosophers of his time, was one ofhis pupils. A poem by him was prefixed to Cohn's encyclopedia. So eminent were his qualifications, both as teacher and as practitioner, that the government permitted him to exercise the privileges of a citizen of the republic. Conegliano's services to Venice and the honors conferred upon him and on his brother by the republic are given in detail in the biography of Israel Conegliano.